A 20 acre lake featuring a beach, boating (non-motorized), fishing, and a protected nesting island. The beach, which faces the south end of Colbee Benton, is a beatiful sand beach with an anchored raft. The lake has been stocked with Largemouth Bass and Tiger Muskies. Crappies and Sunfish are so abundant that you are asked to remove them when caught. Though please return the Largemouth Bass and Muskies. The small island is the 'nesting island'. It is intended as a protected area for birds to nest on and residents are requested not to boat or swim over to it. At it's deepest, Lake Leopold reaches down 18 to 20 feet in the area between the beach and the nesting island. 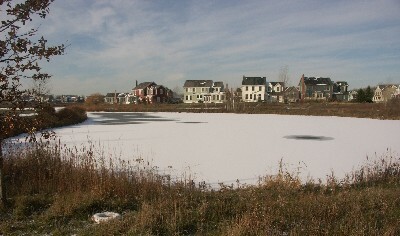 In the winter, ice skating and ice fishing are available when the ice is thick enough. Residents may bring guests to the lake, but we ask that you accompany them when they are there. Note: In the winter, a green or red flag are flown on the flagpole. Red means the ice was less than 4 inches thick in selected areas. Green means the ice was at least 4 inches thick. Green does NOT mean that it is safe to walk on. There may be thin ice in areas not tested. Be safe. Do not go out on the ice alone. There are yellow rescue ladders and life buoys around the lake in case of an accident.